Need dinner ready yesterday? Try some of these 30 minute meals on for size. We know as well as anyone that life gets a little hectic sometimes. Between work, kids, extracurricular activities and keeping a home there isn't always time to get a full course meal on the table for your family. Don't make fast food the norm. These 30 minute meal and snack ideas will help you throw together a delicious home cooked meal in no time, so you can spend less time on your feet in the kitchen and more time doing everything else that needs to be done. Here you'll find a growing collection of quick, simple meal ideas complete with serving suggestions and tips to help you get dinner on the table in 30 minutes or less, without sacrificing that home cooked taste grandma got you hooked on as a child. This page is updated often so don't forget to stop by and check out the latest 30 minute meal ideas for you and your family. Just right click and bookmark this page so you can easily find your way back. Also, click here and subscribe to our blog to be notified when we add new vegetarian recipes and meal ideas. After hearing a co-worker talk about BBQ for a week, I had quite a craving for it. That's what inspired this super scrumptious barbecue sandwich recipe. These are every bit as hearty and delicious as the traditional bbq sandwich, and they are way too easy to make not to have them often. If you're looking for something a little lighter on the stomach that will help you cool off on those hot Summer days, these cold pasta salad recipes are the perfect choice. With a variety of ingredients and dressing options, you'll never run out of crowd pleasing pasta creations. Some require a bit of prep work but the extra effort is well worth it! 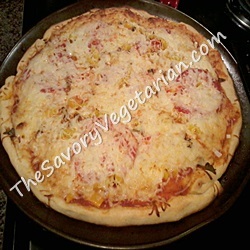 This vegetable pizza recipe is the ultimate, kid friendly vegetarian 30 minute meal. Roll out the dough, spread a little sauce on top, add your favorite veggies and throw it in the oven. That's all there is to it! This is a quick and simple version of one of our favorite hummus recipes... roasted red pepper. Whip up a big batch of this hummus in less than 15 minutes and your family will be snacking healthier a lot more often. Spread it over a whole wheat bun or sub roll as a complement to a homemade veggie burger or fresh vegetable sandwich. Pair it with crackers, pretzels or fresh vegetables as a delicious, healthy snack. This simple cabbage salad recipe is one of my favorites. It's super quick to throw together and the end product is a crispy, crunchy bowl of salad that will tease your taste buds to no end. This recipe makes a great main dish served with toasted rolls or the perfect side dish to complement a variety of vegetarian meals. Can you tell we love pasta? This is a traditional cold pasta salad with lots of fresh vegetable goodness, tossed in a homemade sweet and sour dressing. It's got tons of flavor and crunch, and it can be served as a main dish or a side dish. This is a dish best served after it has chilled for a bit but if you're in a time crunch, don't fret... it is also quite delicious when served immediately. This quick and simple vegetable stir fry recipe is the easiest dinner you'll make all week! Pair it with a sweet and tangy homemade Asian sauce or a store bought sweet chili sauce for a dinner the whole family will devour. Copyright © 2013-2015 The Savory Vegetarian. All rights reserved.